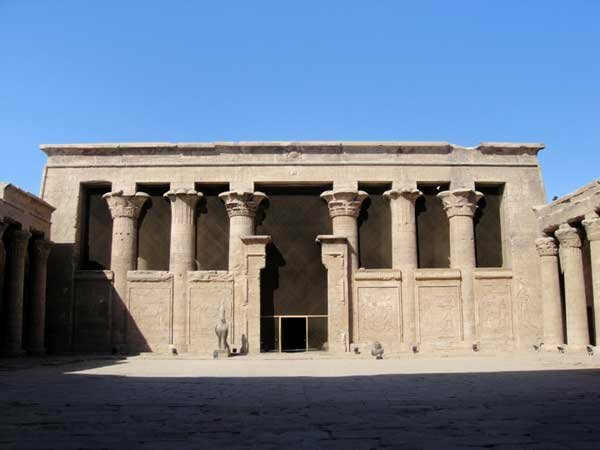 Egypt and Art > Tour Map of Egypt > Tour Edfu Directory > The Pronaos at Edfu Temple. Once inside the pylon, the pronas of this temple comes into view. A pronaos is a hypostyle hall that is completely or half open in the front. This paticular pronaos contains 18 columns. The enterance is flanked by two large granite statues of Horus BehudetyA.K.A. 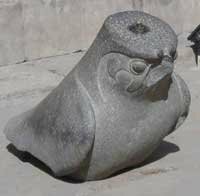 Horus of Edfu. The statue on the right has been heavily damaged.